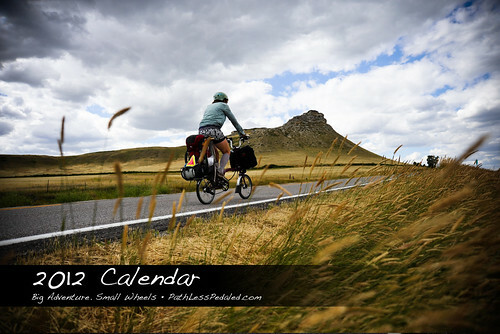 We just finished laying out our new calendar with our favorite images from our Big Adventure Small Wheels trip! It’s crazy to think that this is our third calendar! Every year we have the tall order of searching through literally thousands of images to find twelve that will make our calendar. It’s a mix of color and B&W images that we hope capture the nature of our trip. It makes a unique gift (don’t think there is another calendar out there that shows people touring on Bromptons!) for your bike touring buddies and readers of the site. As always, calendar sales help us continue our journey. We’re running an early-bird special for the month of October and are offering them at a 10% discount. Order yours today and help us get to New Zealand! Will you guys be heading out on another trip this year or are you waiting till next year?? We’re hoping to get to New Zealand for the winter. So we’re working hard to get our next book out very soon to help fund the trip.